GREAT BLOG: Young is in !!!! Since June of this year I've been looking at a blog called "I Tie, Therefore I Am." It is sharp and nifty with bits of feathers thrown in for good measure. The narration is sparse and crisp and the flies are well presented. The goes by the name CHEECH, and has both a sense of humor and a very good dog. Keep an eye on this blog, I sure am. I'll add flies to this section as time allows. Cheech calls this the "El Sculpito" and shows some pictures of fish that ate it. This is a good concept. 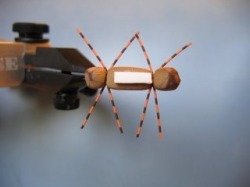 This fly has gone through several iterations on its way to fame. The complete series is documented from a post last August. I'll be interested to see what the tyer feels is the final version. This is my kind of fly: simple, floats high, catches fish. 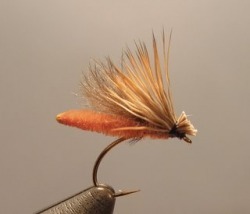 I'm going to tie a bunch for next year's hoppers - - and other times too. Not from a pony tail. But it looks like fun.